While on special assignment doing investigative reporting in Florida, the state where democracy was stolen in 2000, I found evidence of a White House conspiracy. George Bush was found to be meeting with Richard Nixon. No doubt they were discussing techniques to stonewall the press and avoid the appearance of flip-flopping by rendering previous statements “inoperative.” Perhaps Nixon gave Bush a secret plan to get out of Iraq, or even revealed his plan to get out of Vietnam which, to this day, remains a secret. In placing Bush next to Nixon, are the Disney imagineers trying to tell us something? 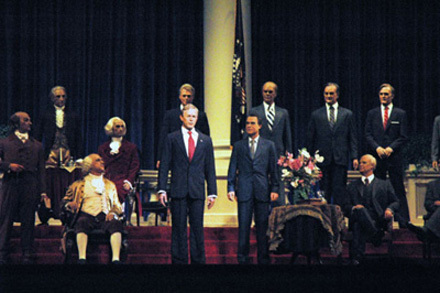 If an animatronic can be made of George Bush which sounds more intelligent than the original, is it possible others have substituted an animatronic for the real George Bush? Could it be that the real George Bush is really a “compassionate conservative” and neocons or the religious right replaced him with an animatronic to pursue their agenda? As a result, Democrats are quietly but urgently seeking ways of pressuring the president to change course, including the possibility of having Congress reconsider its original authorization of force, passed in October 2002. Given the limited options, Sen. Joe Biden (D-Del. ), the Foreign Relations Committee chairman, has suggested to his colleagues that the strongest response to the surge would be a congressional resolution explicitly opposing the step. Whereas cutting off funds is a “hollow threat,” Biden said in an interview this week, a congressional resolution could have a powerful effect if it drew support from the significant number of Republican senators who are increasingly alienated from Bush’s policies. Biden, who expects to offer his proposal at a meeting of Democratic senators today, argued that an anti-surge resolution might not bind the president but would exert considerable pressure on him to reconsider his approach. More intriguing, Biden is studying whether Congress might reconsider the original Iraq war resolution, now as out of date as the administration’s prewar claims. The resolution includes references to a “significant chemical and biological weapons capability” that Iraq didn’t have and repeated condemnations of “the current Iraqi regime,” i.e., the Saddam Hussein regime that fell long ago. In effect, the resolution authorizes a war on an enemy who no longer exists and for purposes that are no longer relevant. I would add to this that Congress should investigate whether George Bush exceeded the authority granted to him. The IWR was passed due to claims of WMD which have been found to be fabricated. At the time the war began there was no sign of any threat to our security from WMD, and as the inspectors had been allowed in there was no justification for using force at that time.